PRODUCTION EXPO 2014: Bob Rock has produced a huge number of rock giants in his time, and one thing that connects them together are the amazing drum sounds he nails. Whether it's Tommy Lee's rap-inspired 26" kick drum on Motley Crue's Dr Feelgood, or Lars Ulrich's huge sound on Metallica's Black Album, these giant sounds formed the backbone of what would become huge albums for both bands. "With drummers and drum sounds I would say 80 percent of the sound is from the source", says Rock. "Obviously miking techniques and compression come into as well, but the bottom line is the way that the guy hits the drums and the source. 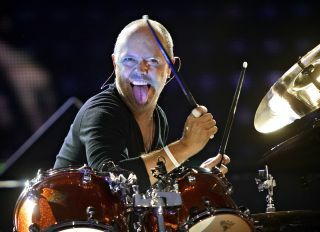 The difference between Lars and Tommy is that Tommy has a built-in laid back feel to his playing because he is so lanky. He is literally further away from the drums and that gives him that feel. They both hit really hard but they hit differently." So, who better to tap up for some world-class drum recording advice? "I started doing this in 1976 and back then everything was very dry and dead sounding. It was all taped down. Then the drum sounds opened up in the '80s and '90s. By recording a lot of great drummers, you take a little bit from everyone. Simon Phillips, I did a record he played on and he came in and I had never recorded a double headed kick. I scratched my head and Simon said, 'This is what you do.' He showed me to put a mic here and a mic there and I took that from the session." "The first thing I learned from [engineer/producer] Bob Clearmountain was to double mic the toms, putting mics on the top and the bottom. Before then I had always struggled with toms and Bob basically took an exaggerated versions of what The Beatles had done with two mics and an overhead and that became the New York sound." "You need to learn to tune your drums. That is the biggest thing. When I started we would tape drums to get rid of the ring. To me that didn't make sense because the drummers that I liked, which was Bonham, Ian Paice, Keith Moon, Ginger Baker, they all had open sounds. I use Ross from the Drum Doctor in LA is because he can tune so well. I can get a great drum sound in 20 minutes now because I know the mics that work, so if you have a tuned drum then you're ready to go." "Whatever your style is, you need to get an engineer to capture that and not make you uncomfortable. Back in the '70s, studios had their own kit already there and that made some drummers uncomfortable and it never made sense to me. The most important thing is to be comfortable." "A drummer needs to say to an engineer, 'This is my sound, come out and listen to me play and listen to my drum kit.' You need to do that and then get your sound."